I recently visited Manchester Art Gallery, with the Art Galleries and Museums group from Henshaws, for an audio described talk and tour of the newly-opened Eastern Exchanges: East Asian Craft and Design exhibition. This show creates a fantastic platform in order to display Manchester's historic collection for the first time in over 30 years! The exhibition boasts over 1,500 years of the rich craft heritage of China, Japan and Korea, including works of ceramics, metalwork, furniture, lacquer, textiles and sculpture. Exhibits range from historical court treasures to modern pieces by contemporary art makers. While there is some overlapping of styles each country developed its own distinctive forms and specialities. These national craft traditions are sources of pride and identity, with highly specialised skills being perfected and used over generations to create such luxury objects. Audio description was provided by Anne Hornsby, of Mind's Eye Description Services, with additional detailed talks provided by curator Janet Boston. The collection is supported by The Korea Foundation and The Great Britain Sasakawa Foundation, and sponsored by Kuoni and Shangri-La. Our visit was arranged and organised by Meg Parnell, Lifelong Learning Manager. 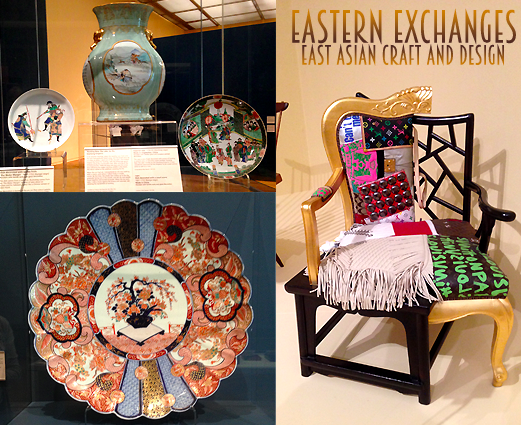 Eastern Exchanges is divided into 3 sections; with the first area focusing around items that are 'Distinctively Asian'. The majority of pieces here belong to the aforementioned historical court treasures. 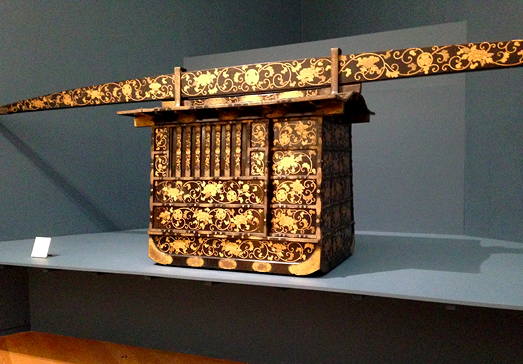 The first item we were audio described was that of a Japanese Norimon (also known as a Sedan Chair) made from beautiful black lacquer and decorated with intricate gold patterned detailing of flowers and leaves. The Sedan Chair was exclusive to royalty as their way of transport, with 2 or 3 men at either side carrying it at arm's length. The Japanese borrowed the concept of lacquer-making from China, developing and perfecting it even further, eventually becoming the frontrunners of beautiful lacquer items sold worldwide. 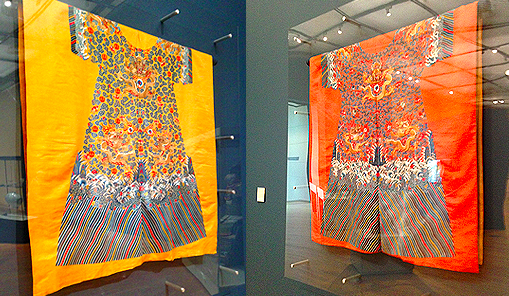 The second items we were introduced to, still among the court treasures, were two exquisite embroidered Imperial robes; one of the garments belonging to the Chinese Emperor himself and the other to his son, the Prince. Despite being extremely expensive and taking over 2 years of strenuous embroidery work, focused on the intricate elements of flowers, waves and dragons, they weren't even cut out of their original material and sewn together to wear! This really highlights the extravagance and wealth of the Royal Family at that time. The next area consisted of more modern contemporary pieces, mostly furniture and decorative items, aptly named 'East Meets West'. The pieces within this section are hugely influenced by conventional Asian design and incorporate traditional techniques. 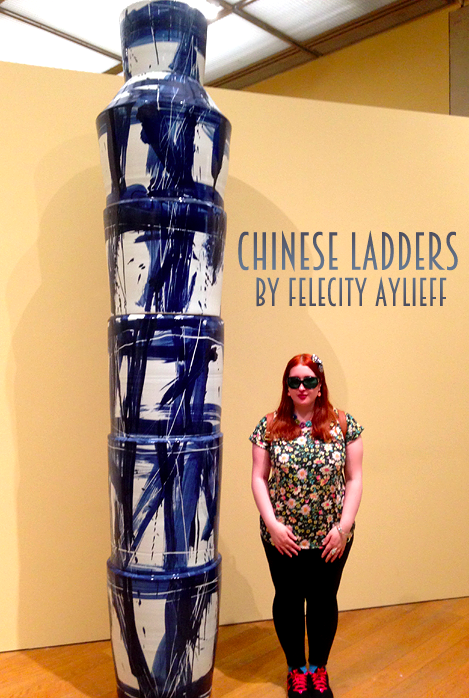 The main item of interest, towering high above visitors, is the gigantic contemporary piece known as 'Chinese Ladders' by Felicity Ayleiff. Ayleiff herself enlisted the help of the Jingdezhen Experimental Porcelain Factory Nº2, a site of Imperial kilns with centuries of experience in firing large-scale ceramics, to create her own series of enormous works. 'Chinese Ladders' was created by using a technique called luting. This is created by joining together hardened clay structures with liquid clay, more commonly referred to as slip. The stacked form took great inspiration from bamboo scaffolding seen in building sites across China and integrates heavy strokes of traditional Chinese brush painting. 'Weave Stool' by Fumio Enomoto, commissioned by the award-winning designer specially for the Eastern Exchanges exhibition, incorporates aspects of functional with comfortable whilst still being of modern design. It is made entirely from bamboo and is a direct replica of its original. Bamboo is a widespread popular material in East Asia that can be spun, heated, shaped and glazed easily. This particular stool was created by using 12 strips of bamboo, weaved from the centre extending outwards, and was inspired by traditional Japanese bamboo baskets. It won the 2011 Bronze Leaf Award at the International Furniture Design Fair. 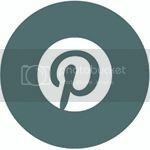 During the audio described talk, a thick piece of bamboo was handed around the group to enable us to gain a better understanding of how lightweight and flexible the material truly was. 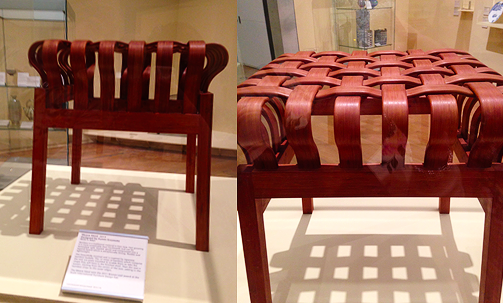 It's a shame we couldn't touch the stool itself to feel the weaved design and its exact pliability, but I appreciated the example we did get to touch. The final area comprised of modern sculptures, vases and other decorative objects; pulling away from the more-traditional crafting techniques displayed in the previous sections, but still making their mark as Asian masterpieces sitting nicely alongside the other exhibits. 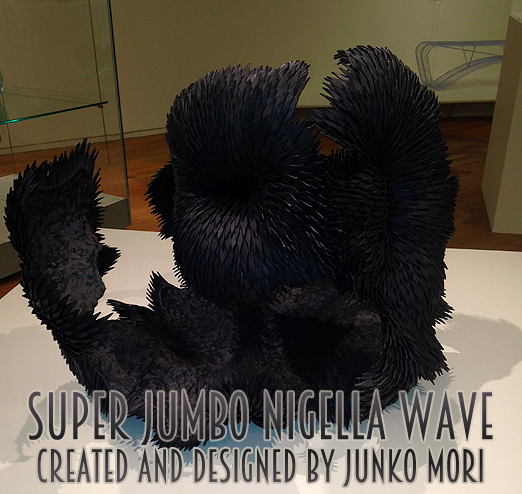 My favourite item of the wntire exhibition was housed in this area - the incredible 'Super Jumbo Nigella Wave' by sculptor Junko Mori. This was truly impossible to audio describe! I did enjoy the different interpretations though, and each provided me with a unique mental image of what it could look like visually. Inspired by the growth of living things, particularly plants and sea creatures, Mori incorporated various metal forms and materials into her sculpture to develop individual petal or leaf shapes that give her work phenomenal character. Each leaf / petal was assembled and welded together to create something that can only be described as 'uncannily organic'. The piece was originally inspired by Nigella, a cottage garden flower, but her work took a different approach and was propelled forward after the Tsunami struck Japan in 2011 - taking it into a more powerful, cataclysmic direction. 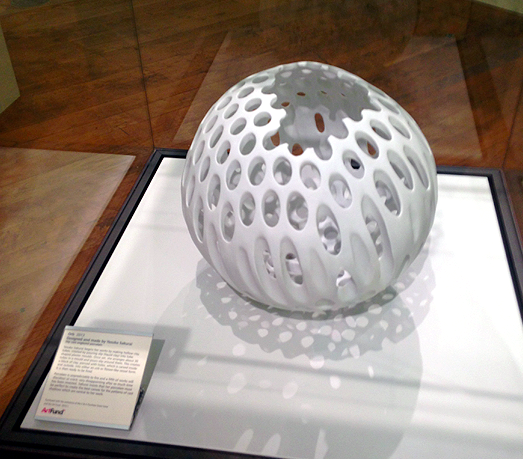 'Orb' by Yasuko Sakurai closed the Eastern Exchanges exhibition visit for the group. This piece is an elegant coral-like ceramic form, created by hand using a newly-developed technique by the sculptor herself. It was created using Seto porcelain and, as with Junko Mori's work, gives the impression of something organic and life-like. After studying in the French pottery town of Liomges, Sakurai discovered her fascination of porcelain and invented the idea of piercing holes into it by amassing tube shapes, building vessels around them and then removing the rubes to create elliptical and rotund gaps within the work. She particularly engages with the idea of using light and shade in her ceramics, so incorporates minimalistic colour and design to interpret this. I want to say a big thank you, as always, to Mary Gifford of the Art Galleries & Museums group for arranging the visit; it is always a pleasure to attend, and the exhibitions inspire my illustration work massively. Also thanks to my sighted guide, Mary Tantrum, who helped me to take the photographs and for taking me to the exhibition, to Janet Boston for the informative talk and tour, to Meg Purnell for organising the visit and to Anne Hornsby for her captivating audio description. 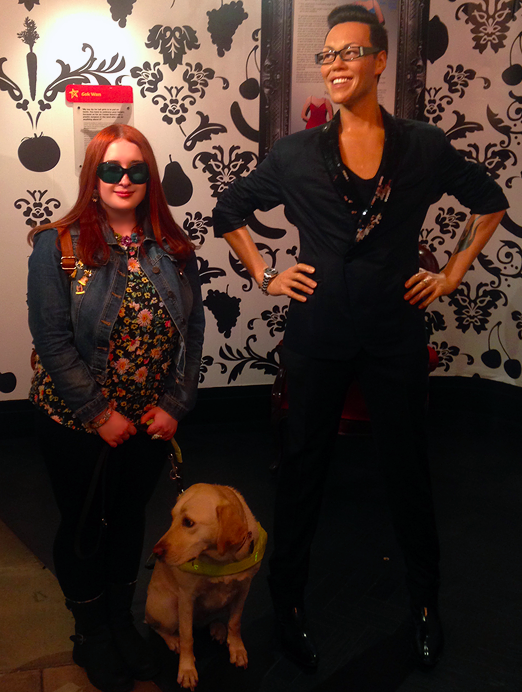 I was recently asked the question, "How would someone with a sight impairment enjoy visiting a venue that is completely visual, such as Madame Tussauds? How would that work?" 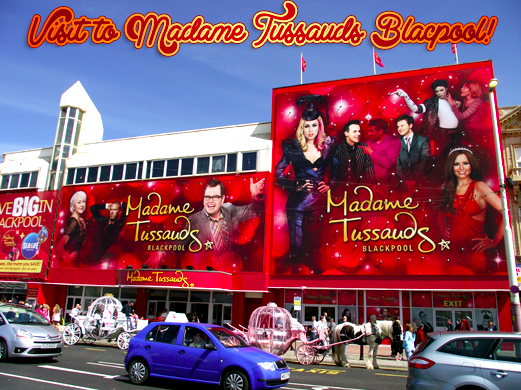 As someone who frequently visits museums and art galleries that provide accessible tours, this intrigued me to find out more - so I planned a visit to the Blackpool venue earlier this month! 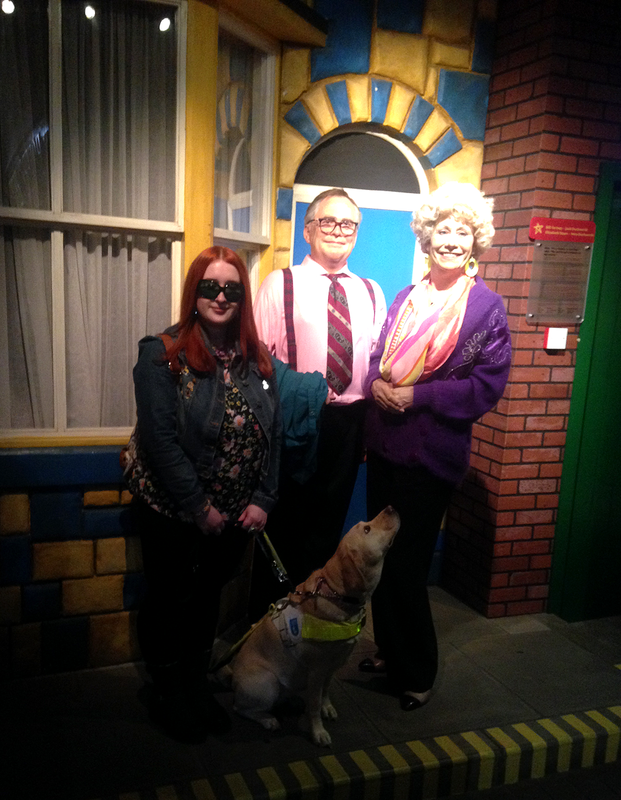 Upon my arrival, I was greeted by the staff members who helped to plan my visit and they lead me and my Guide Dog, Tami, into the main entrance, away from the busy crowd of tourists, for a specialised talk and tour of the wax figures and interactive sets on offer. 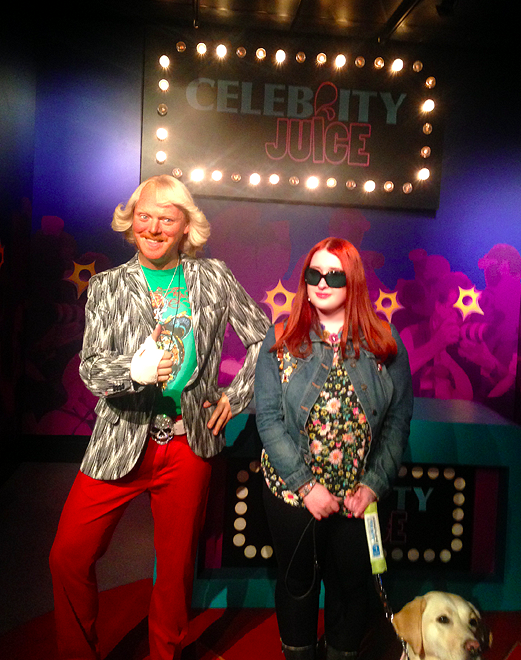 The attraction on the ground floor opened with various popular television stars and personalities, among whom included Simon Cowell, Jeremy Kyle, Bruce Forsyth, Keith Lemon, Gok Wan, Alan Carr, and Graham Norton. Each figure was audio described to me; detailing their pose, outfit and backdrop arrangements, as well as additional bits of information such as how the figures were made, how much time and money was spent to develop each one, what the real celebrities were like during the unveiling process at the venue itself! The floor above was the one I was most interested in visiting, as it was that of the famous cobbles belonging to Coronation Street! I was very enthusiastic to explore this area as someone who has grown up with the popular long-running soap.The Corrie section began at the Rovers Return Inn (of course! ), where Hilda Ogden stood outside very proudly, and it is a fully-functioning and licensed pub for those who wish to buy a drink and something to eat. 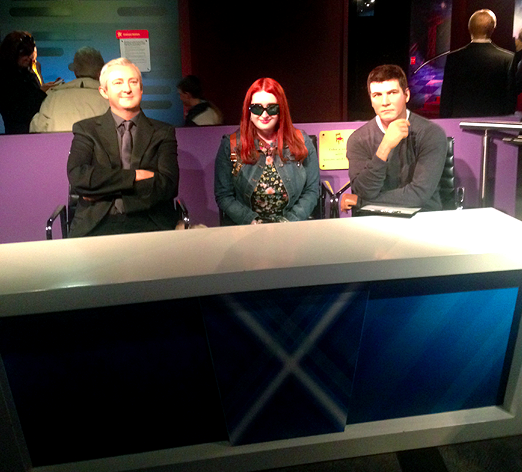 Ken Barlow and Bet Lynch were positioned alongside the bar and Deidre Barlow was sat at a nearby window-seat. Around the corner stood Jack and Vera Duckworth with Vera covered in bright, floaty fabrics with her trademark big, circular earrings – which were very tactile to touch! 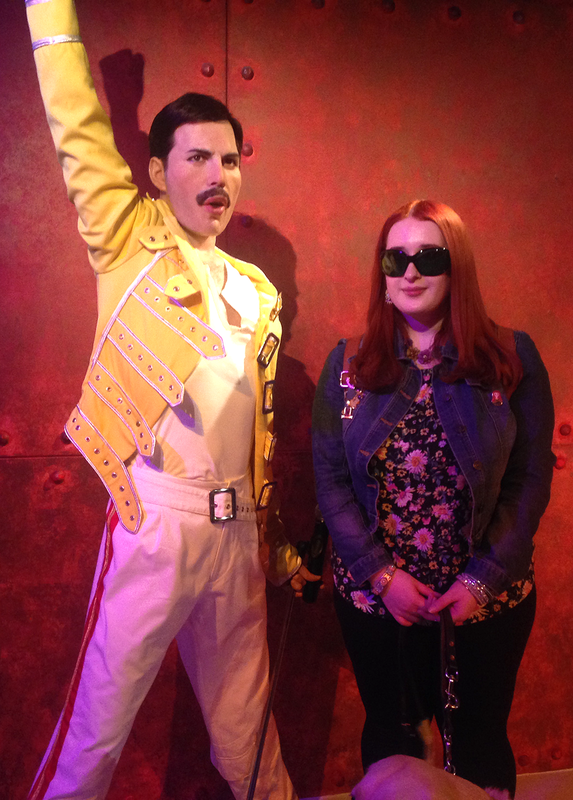 Famous musicians made up the next selection of figures I wanted to visit, including megastars such as Michael Jackson, Freddie Mercury, Shirley Bassey, Tom Jones and Leona Lewis. 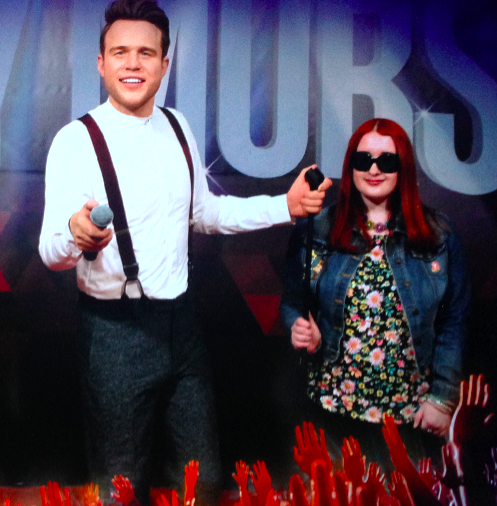 My absolute favourite, though, was the newly-installed Olly Murs wax figure – the pinnacle of my visit! – and I didn’t hesitate when I was invited to touch and explore his face to get a better understanding of what he looks like and the sheer amount of intricate detail crafted within the figure’s facial structure. From his light feathery eyebrows and eyelashes,to the softness of his trademark quiff, and the coarse stubble running along his jawline, I had the unique opportunity to “meet” my favourite modern singer and experience something very personal and meaningful to me – to see Olly Murs for the first time – that I wouldn’t have been able to have had otherwise with my small amount of deteriorating vision. 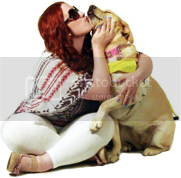 My severe sight impairment meant that I got to have a unique, intimate experience that a lot of other people probably wouldn’t have had even with their fully-functioning sight. 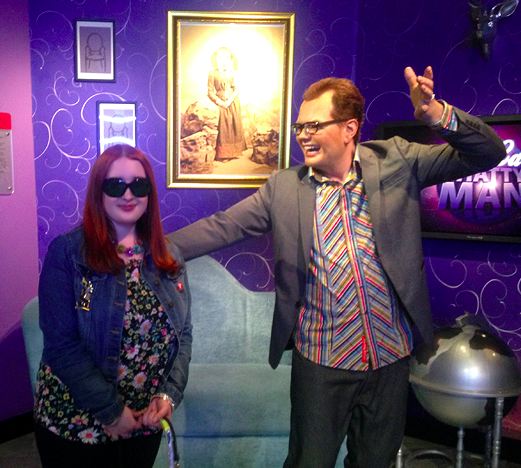 In front of the Olly Murs display was the opportunity for a professional photo with the star, where I happily posed for a snap, and I purchased my photo at the end of my visit cased inside a special Madame Tussauds frame! 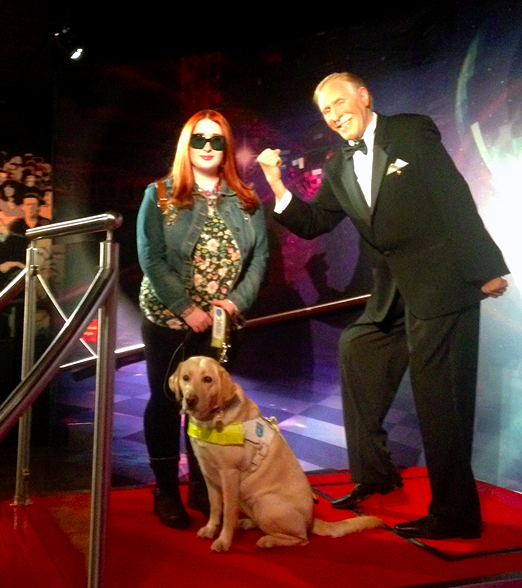 So, in response to the original question that piqued my interest; “How would someone with a sight impairment enjoy visiting a venue that is completely visual, such as Madame Tussauds?” The answer is, quite simply, that the Madame Tussauds staff will ensure that any visually impaired or blind visitor coming to their attraction will have as equally as memorable a visit as a sighted person. 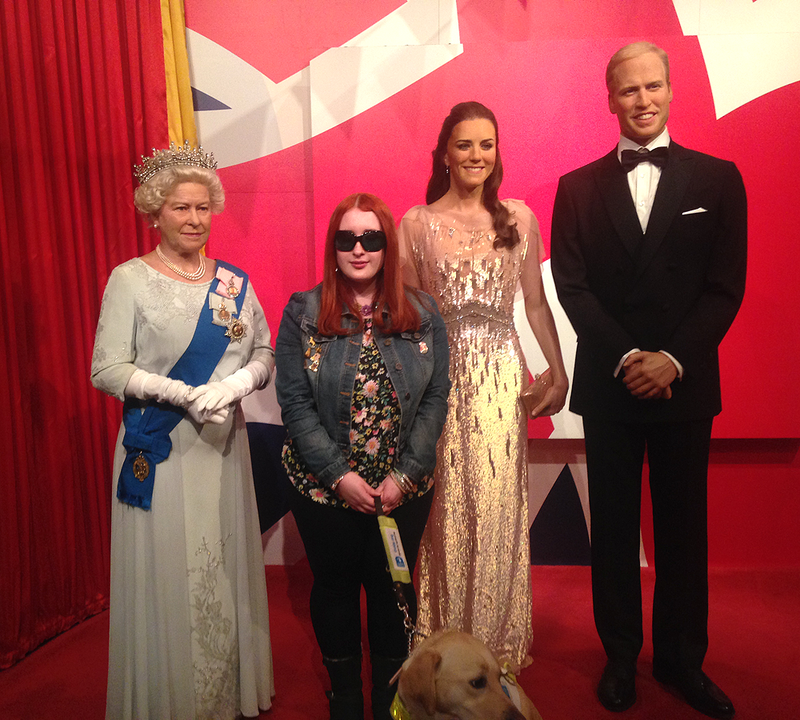 They will be offered a guided tour, audio description and safe lift access, as well as the opportunity to have photos taken with each waxwork and a personalised, tactile approach to the figures on display. 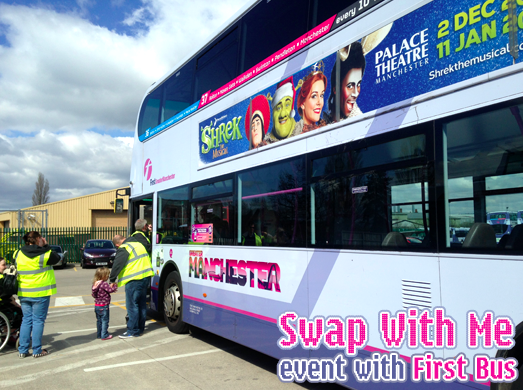 This afternoon I attended a 'Swap With Me' event with First Bus at their depot located in Bolton. 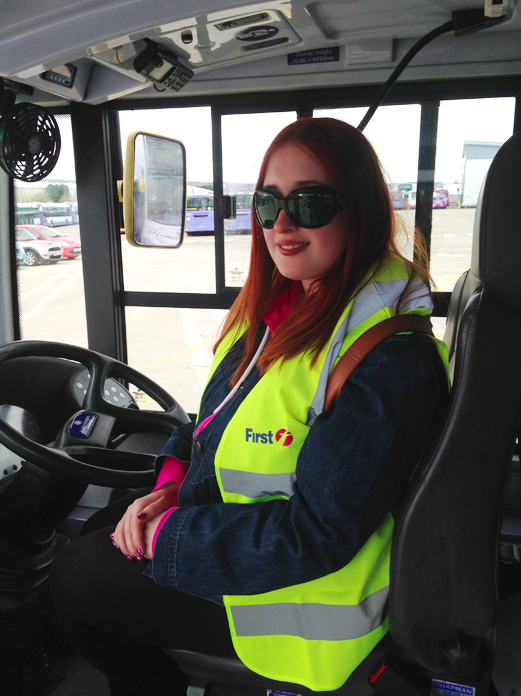 The event was designed to give blind and partially sighted people the opportunity to speak directly with bus drivers and staff members to raise their issues and concerns when travelling via bus with a sensory, and in some cases even dual, impairment. After introductions, the event began by discussing some of the most common challenges of bus travel, including; being unable to read the bus numbers, not seeing where the pass scanner is, the inability to identify which stop to get off at, inaccessible formats of bus timetables and schedules, dealing with too many pushchair users in the priority seating area, drivers giving too many visual signals and not identifying the correct stop to get off when asked, buses driving past, and so on. There was a two-way communication link with the staff, helping to develop solutions to the regularly occurring issues for visually impaired passengers. After raising some of the most prominent concerns, it was time to visit the depot itself where two different models of buses were parked; a single-decker and double-decker, each with a different colour-scheme encompassing the corporate colours, therefore containing different contrasting handrails, and a different layout inside to navigate around. Participants of the event even had the opportunity to sit inside the driver's seat and experience things from their point of view. One thing I discovered was how cut-off drivers actually are and how it feels like another world inside the cab compartment, far removed from the bus itself. 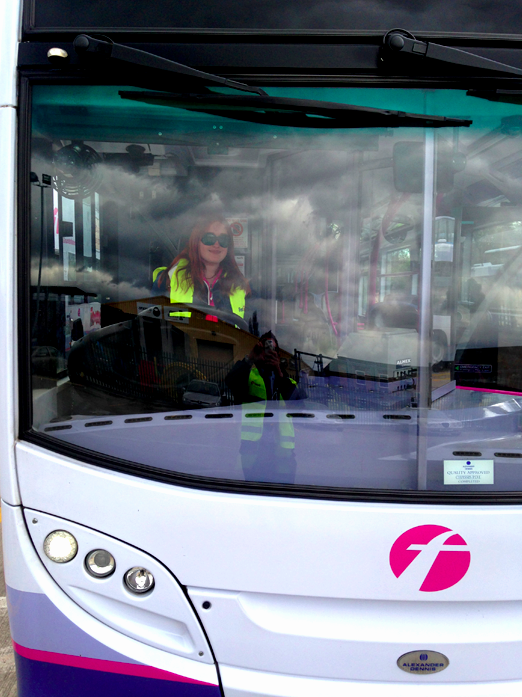 With the engine running, the sound of passing traffic and background noise from the passengers of the bus, it makes it very difficult to hear - on both sides of the perspex glass, as a driver and a passenger. This really highlighted how important it is to me that drivers are as verbal as possible, rather than visual, to VI passengers. 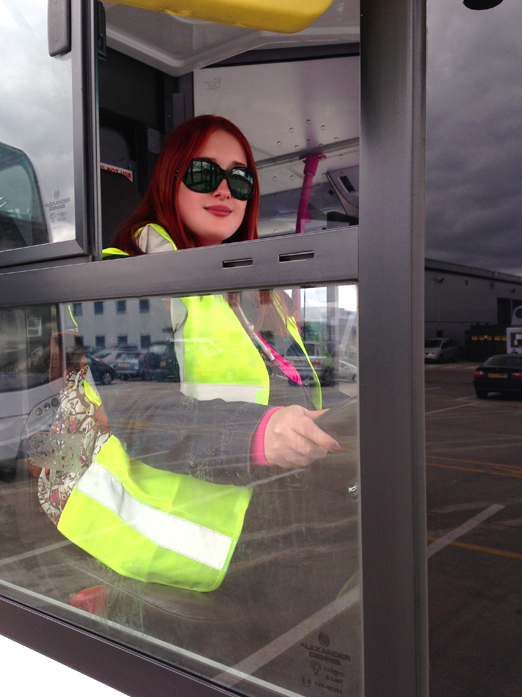 Drivers and staff were given simulation spectacles (simspecs) to experience first-hand the different sight conditions, and how they affect vision, whilst boarding a bus, scanning a pass and making their way to a seat. They all agreed how very difficult they found the experience, even though they knew where everything was located, because of the distorted remaining vision they had adopted. Their depth perception was skewed and items were much further away than they thought when relying on what little sight the glasses gave - a much better representation than just using a blindfold. Now they have to imagine finding everything while the bus is moving! After the activities, we returned to discussions this time focusing on how better to improve services and support First Bus blind and partially sighted customers. The main thing pinpointed by all VI attendees was that there is no such thing as giving too much help; someone will gladly say if they don't need assistance. It is better to be asked if you need help rather than to be ignored and left to struggle! Other suggestions mentioned in the concluding debrief included better colour contrasting handrails for those with some remaining vision (either a new hi-vis colour replacing the pink and blue or adapting with hi-vis tape), using the ramp not just for those in wheelchairs but for those who find the large gap near the curb disorientating, having the drivers more aware that not all blind and partially sighted people will have a visual clue such as a cane or Guide Dog, supporting passengers by shouting the bus numbers as they board and when dropping off on a different route or drop-off point to let the VI person know about such a change. The event this afternoon went really well and hopefully spotlighted some of the major concerns that blind and partially sighted people in the area face on a regular basis. I hope to encounter the aforementioned improvements in the near future as the First bus drivers and staff members in attendance seemed very keen, enthusiastic and responsive to our suggestions. I have also offered to help 'mystery shop' and test out the various First buses across Manchester, taking note of the bus number and time I travelled, to provide accurate feedback of the driver and my experiences. Thank you to First Bus in Bolton for listening to the group that visited today and I look forward to working with them again in the future! 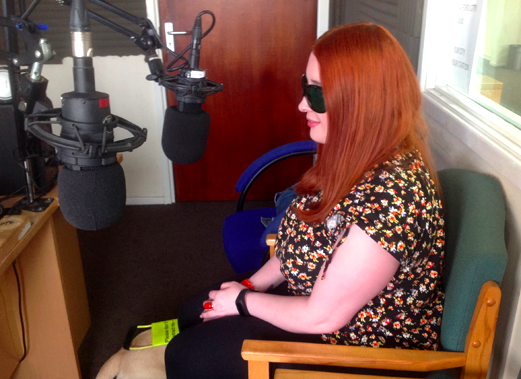 Yesterday I visited my local radio station, Salford City Radio (94.4FM), during Howard Copitch's Wednesday lunchtime show to talk about my sight loss story of losing my vision at a very young age and reveal how the Henshaws Society for Blind People charity has made a huge difference to my life over the past two years. I've previously had media training with Chris Brophy, Co-Founder and previous Manager of the station, so was very excited to utilise the skills I learned last year as well as share my story and inform local listeners of how Henshaws can help aid and assist them through a variety of different ways; either by one-to-one skills building, peer support groups and skills based courses. 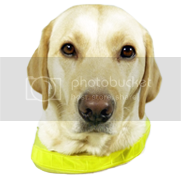 Support is specially tailored to each individual to help them overcome their impairment and achieve their potential. 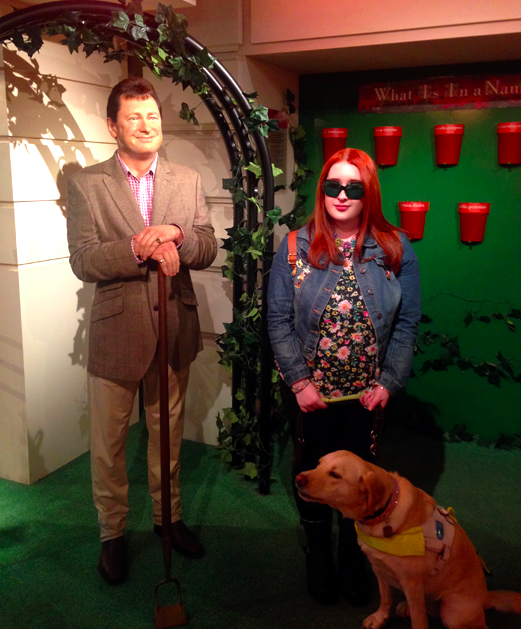 Mark Belcher, Community Services Manager at Henshaws, joined me in listing some of the various different groups and detailing the Pathway to Independence and how it can help those new to sight loss or new to receiving support. The confidence and independence I have today is a complete result of the Pathway and being on the radio was a fantastic way to platform the success it can give to someone. Howard was very interested in Tami (of course!) and I was more than happy to tell Salford City Radio listeners of our partnership, how we were matched and the things we get up to on a daily basis! Unfortunately there wasn't a livestream available at the time so I don't have a podcast to share, but I enjoyed my time on the show immensely (I even got to request a song - Duran Duran's 'Hungry Like the Wolf', if you're wondering!) and would like to say thank you to the Henshaws Marketing Team, Salford City Radio and Howard Copitch for the interview opportunity. I really enjoyed being in a radio station environment and it's certainly something I would love to do more of in the future! 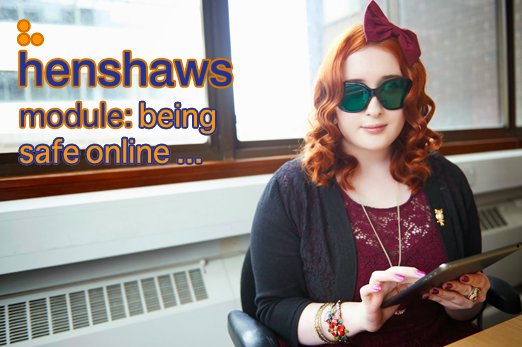 Today I attended a new session at the Henshaws Manchester resource centre, called 'Being Safe Online', a module as part of the newly-established TechTalk group that I'm a member of and partake in each month. This was the second time that the session has been delivered through Henshaws and I enjoyed it so much that I wanted to tell you more about some of the topics we covered. 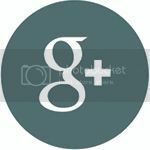 Being online is an amazing experience especially for visually impaired and blind people today, with the accessible technology that is currently available and is still being developed and improved every single day. The dangers of being online are rarely ever discussed when talking about the online experience though, and that is what the session strived to highlight and explore with blind and visually impaired service users. 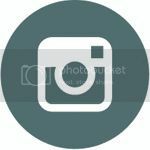 While a lot can be gained by venturing into the digital landscape, there are many negative aspects to be aware of too. The session began with the group identifying some of the most popular icons of websites that are frequently used on the internet like Facebook, Twitter, YouTube, Amazon, Skype, eBay, Google and Wikipedia - all extremely useful tools in their own right which can unfortunately be abused. The tell-tale symbols of each website were described to the group and we had to name their purpose and functions, such as; communicating, shopping, gaining information and entertainment. We touched upon some of the most common text-speak abbreviations and what they stand for, and I'm proud to say that I knew the majority of them! There were a few I'd never come across before (particularly paw - parents are watching), so that was interesting for me to learn some of the new lingo that wasn't used back in the days of my chatroom use during the early 2000's. 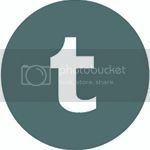 As a group we suggested some of the things that we may come across online (such as on the aforementioned websites) that could possibly ruin someone's positive experience. 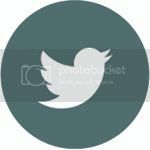 Cyber-bullying, cyber-stalking, phishing and spamming, trolling, sexting, blackmailing, identity theft, grooming, hacking, malware and viruses, and inappropriate material / attachments were the main dangers that were spotlighted. We then had to match the definitions of each to the correct term in order to gain a better understanding of what they mean and how they can happen to anybody online. Activities were then explored in smaller groups where situations were provided, either in example e-mails, tweets, chat conversations or Facebook comments, and we had to identify the danger, what the intention was and how it can be avoided (ie: through filtering, blocking, ignoring and / or reporting). Facebook settings were discussed and the how different levels of privacy setting affect the audience looking at the posts or photos, even in ones where someone else has been tagged, and whether certain bits of information are even needed to be provided on Facebook publicly (like marital status or interested in / looking for - and how these can actually affect the ads on the page thus driving forward a surge of potential hackers, robots and / or trolls as the audience on the page itself). Also be wary of strangers adding you on websites like Facebook or Skype who will have access to your personal information or possibly probe you for it. Storing passwords and credit card information on shared or public computers was touched upon and highly advised against, and when shopping online using PayPal is a much safer option. 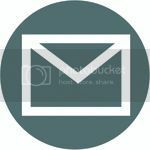 The group learned about identifying spammy e-mails with clickable links within them asking for personal details like passwords to be changed or addresses, phone numbers or bank details needing to be updated. Banks will never actually ask for this information via e-mail as there is no need to. 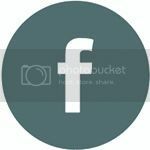 Location services being enabled, either through Google, Facebook and Twitter, was a major concern for the group and it is always best to ensure these are switched off (particularly on a mobile device). 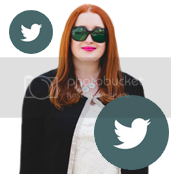 Mentioning you are on holiday, or in a different location, publicly on social media to people you do not know or do not trust is also never a good idea! Towards the end of the session we learned more about ads and popups and how those can be harmful with inappropriate images, especially to minors, and the module was ended on the subject of passwords and how long it takes to crack the varying strengths. The more characters that are used, including uppercase, lowercase and numerical characters, the harder it is for a hacker to crack the code. Using simple, guessable passwords on a multitude of websites can lead straight to the possibility of being hacked, with someone being able to quickly guess the password through information that they can access publicly on your social media accounts (such as birthdate, address or mother's maiden name). This was something that the group really responded to. It's all about being aware of what people (and the internet) can be capable of and this session was a fantastic introduction to that. 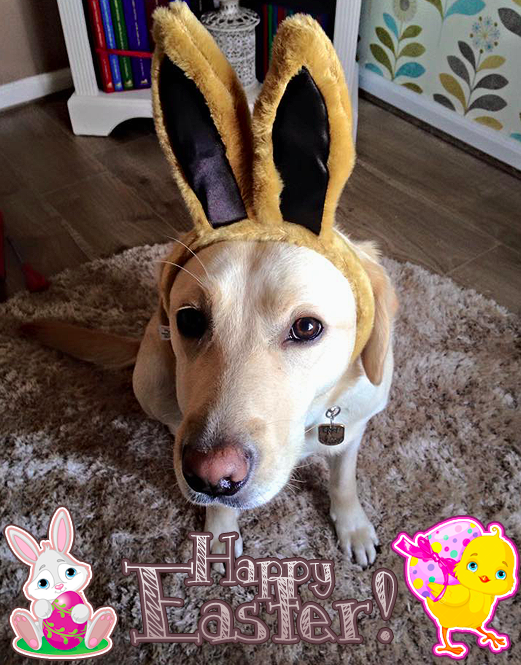 Some things are common sense and other things, such as learning about malware, viruses and trojan horses being cleverly disguised within downloadable links or attachments, can be learned. 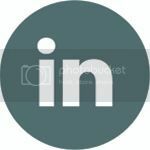 All levels of ability are welcome and the minutes from each meeting, including useful links to products and services, are shared via e-mail at the end of each session. I mentioned in my previous Envision blog post about the election voting process for the new steering group body of the campaigning network, helping to shape and drive campaigns forward and providing a voice of the wider membership. A huge number of votes were received altogether and Envision would like to thank those who took the time to vote! Other members in the wider campaigning network are still encouraged to be involved; feeding into campaigns and supporting our presence online via our social media accounts. I look forward to getting stuck in again this year and helping to promote the network through various avenues, including social media, and building upon my portfolio of already-established campaigning skills. I will, of course, be blogging about everything Envision gets up to in the next 12 months!